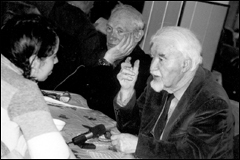 Histories of Soviet Jewry have usually told stories of oppression and resistance. In Soviet and Kosher, Anna Shternshis, a Moscow-born professor of Yiddish language and literature at the University of Toronto, presents a less dispiriting narrative. In researching the book, she interviewed more than 200 Jews who lived through the first decades of the Soviet Union and found that they often had a very different relationship to Soviet ideology. The Soviets banished religion, but, in the 1920s and 30s, they actually fostered secular Yiddish culture as a viable path to socialist enlightenment. Your book suggests that Soviet Jews weren’t necessarily forced to give up their traditions. Why was it so easy for them to let go of their religious observance? I wouldn’t say it was very easy, but it was a lot less difficult than we scholars used to think. Until very recently, the general story we got about Soviet Jews is expressed in one sentence: “Oy, we suffered.” Soviet Jewish history used to be seen as a history of oppression. The rabbis were punished and sent away, the refuseniks also in the 1970s, the Yiddish writers were killed. Recently, a lot of scholars decided to challenge that. Yes, the elite of Jewish religious circles suffered a lot, and maybe the elite of Jewish pre-revolutionary culture suffered a lot, but the majority of Jews embraced the Revolution because they saw it as a possibility to advance in Russian society. And they really did want to advance in this society. They had lived in a pre-revolutionary Russia, which they hated, and in which they were hated, too. Many thought that the rejection of Judaism and family continuity was a small price to pay for this new unlimited opportunity. But I also don’t want to sound like everyone was abandoning Judaism and becoming Soviet. 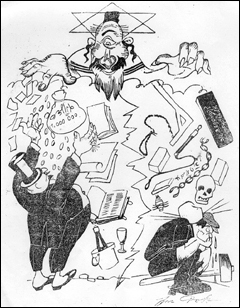 All the anti-religious propaganda among the Jews was done in Yiddish, by Jews—usually former yeshiva students who knew the tradition very well, who knew all the contradictions of the Jewish way of life. They didn’t just invent propaganda. They said things that were very close to the heart of the audience, who disliked the price of kosher meat, who thought the rabbis were cheating, who thought the value of Shabbat and Yom Kippur was exaggerated. Basically, the propaganda said: You don’t have to practice Judaism to be Jewish. It’s enough that you speak Yiddish, like Yiddish poets, read Yiddish books, sing Yiddish songs, and go to the Yiddish theater. They centered it around the language. Yiddish trade unions were created at all factories where Jews worked, Yiddish clubs were established in all hamlets, townlets and cities. For those who could not read Yiddish, literacy programs were established. The goal was to bring propaganda to the Jews in the language that they understood best, and meanwhile to build a secular Jewish culture, free of any religion, yet filled with the specifically Jewish proletarian spirit. Yiddish was seen as the perfect medium for the expression of this spirit. What was it in that environment that enabled the father of one of your interviewees to be both, in his words, a “professional atheist” and a zetser, a matzo bakery assistant during Passover? The truth is, for many people it was: For the Soviet government you do this job, as we say in Yiddish, parnose—as your source of income. When you’re with Jews, you do something else. This woman, Etva, who was from a religious family, told me how as a little girl she starred in an anti-religious performance in school against Passover. They were even eating bread on stage. And her father, the rabbi, comes to that performance, sits in the first row, and really wants to hear his daughter perform. It doesn’t matter to him if the play goes against everything he believes in. She was selected to perform. And she was so excited. She’s nine years old. What does it matter? Etva kept telling me, “What don’t you understand about this? It’s not about my father’s personal beliefs. It’s about adjusting to the system.” And adjusting to the system on paper had to mean denouncing Judaism, but in real life there were a lot of gray areas. In that society the audience didn’t really accept the propaganda. Russians, and my subjects especially, they never just read what’s written. They read between the lines. You date your book 1923-1939. Most casual students of Russian history think of the 1930s as a dark decade of show trials, purges, oppression of anyone with a perceived double allegiance—a category the Jews certainly fell into. But you found that the Soviet government continued to sponsor and promote Jewish culture through the late 1930s? Yes. Yiddish schools were sponsored until 1935, officially, and remained open until 1938. The publication of Yiddish books continued. (In fact, the year when the most Yiddish books were published is 1932.). 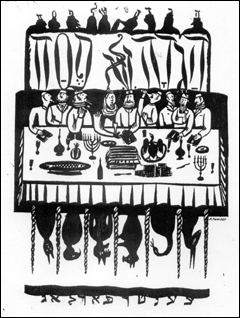 Yiddish theaters around the country functioned until 1941. 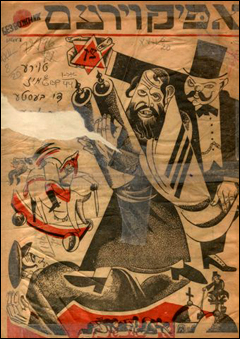 The Moscow Yiddish Theater was sponsored as late as 1948. Because other facilities were closed, the theater actually replaced the Jewish cultural center and became like a new synagogue. It became a forum where people discussed Soviet policies and how to avoid taxes. On stage, too, lots of subversive ideas. What prompted the government to close down these institutions when they did? Ironically, the real reason was that Soviet Jews were no longer interested in them. Parents did not want to send their children to Yiddish schools because they thought this would diminish their chances of entering institutions of higher education. The Yiddish-speaking public also often preferred Russian-language theaters, literature, and other media. They often saw Russian culture as a step higher than the Yiddish one. So, they abandoned Yiddish institutions and the government decided that the Sovietization of Soviet Jews was complete. But weren’t these preferences the product of duress? Doesn’t that limit the value of studying those who didn’t resist? Yes, the rejection of Yiddish schools was in some way the reaction to the Sovietization—Jews genuinely believed that the Soviet education was “better” than the Yiddish one. The real question is “how did they not resist?” It is one thing to send your children to Russian school, stop doing things Jewish completely, and forget you are a Jew. It is completely another thing to send your children to Russian school, and then at home tell them that Jews do not do certain things—socialize with criminals, study poorly, or completely trust the government. They do keep going to Yiddish theater, and also sing Yiddish songs about dowry and pedigree, whereas in school they learn that these values are not valid. In other words, I am trying to say that their lack of public resistance does not mean that they completely accepted the new values. All this sounds like a parallel history. The political side—show trials, purges, the ideological calcification in government—doesn’t play much of a role in your narrative. Is that intentional? I just followed my subjects. If you noticed, I haven’t quoted the sons and daughters of famous Soviet Yiddish writers—Itzik Fefer and Dovid Bergelson and Peretz Markish. I could’ve gotten their memoirs, but that wasn’t the point. I wanted to show how an average Russian Jew lived through this time. And the whole point is that, well, they tried to live a normal life as much as they could. The events of Moscow, the arrests and suppressions—most people did not realize the magnitude of what was going on. They were just trying to live their lives. They were enjoying their songs and their theater. How has this approach been received in the academic community? Now the community is more or less agreed that we need to revise the approach of oppression dominating everything. Studies of Nazi Germany are going through the same thing. We think Germans were all dominated by Nazi ideology, but some people put the Nazi flag in the window but inside the house they were skeptical about the regime. The history we have about Jews in the former USSR comes from refuseniks and people who had to flee Russia, and their story is, of course, the story of oppression and resistance, but it’s not the only story that exists. Many Soviet Jews have come to the United States, a country with a very different set of rules about what constitutes Jewishness. How has that affected their attachment to the faith? Most representatives of Western Jewish communities who deal with Russians are usually Chabad or ultra-Orthodox Jewish communities, for whom the only expression of Judaism is religious observance. Soviet Jews are very threatened by that because they don’t get the whole Judaism thing. They’re actually much more interested in Russian Orthodox Christianity. Judaism, with its lack of visible spirituality and emphasis on everyday observance, they really don’t understand. And they don’t like rituals because of the Soviet experience. So as a result, these Soviet Jews often depart even further from Judaism in the United States than they ever were in the Soviet Union.